(Host) President Barack Obama’s visit Friday is the first in Vermont by an incumbent president in 17 years. VPR’s Melody Bodette is at the airport. (Bodette) Air Force One landed at the Air National Guard base in Burlington. 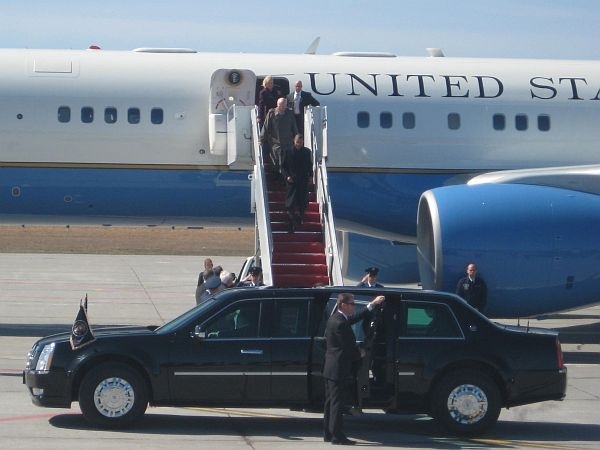 After a few moments, the plane taxied toward the crowd and the president emerged from the plane along with Senator Patrick Leahy and his wife, Marcelle to the cheers of about two dozen waiting guests. The people on the ground included Sen. Bernie Sanders, governor Peter Shumlin and Adjutant General Michael Dubie. After shaking hands with the waiting crowd, the president got into his waiting motorcade and headed off to a private luncheon at the Sheraton in South Burlington. Later Friday there will be a campaign rally at the University of Vermont. For VPR News, I’m Melody Bodette in South Burlington.